The Me Too movement was on the minds of everybody in attendance for the 75th annual Golden Globes ceremony and many of the top awards went to timely movies and TV shows that reflect the tumultuous last year. Sexual harassment and assault were the main themes of 2017 and many wondered how one of the first major awards shows would handle the controversy. Host Seth Meyers immediately addressed the elephant in the room by saying, "It's 2018 - marijuana is finally allowed and sexual harassment finally isn't," summing up the sense of change in the air. The Hollywood Foreign Press Association highlighted some favorites of 2017 and sent others home empty handed in a surprising turn of events. Three Billboards Outside Ebbing, Missouri, Lady Bird, and The Shape of Water all took home the top prizes, while other critical favorites such as Dunkirk, Get Out, Call Me by Your Name, and The Post were left out in the cold. The Best Motion Picture Drama award went to Three Billboards Outside Ebbing, Missouri, Best Motion Picture or Comedy went to Lady Bird, Best Director went to Guillermo del Toro for The Shape of Water, Best Performance by an actress in a drama went to Frances McDormand for Three Billboards, and Best Actor in a drama went to Gary Oldman for Darkest Hour. Writer-director Martin McDonagh's dark Three Billboards, which had six nominations, proved to be the evening's biggest winner with four wins, including the top prize in the drama category as well as awards for McDonagh's screenplay and for the performances of Sam Rockwell and Frances McDormand. Elsewhere, Ladybird took home two awards including Best Actress in comedy or musical to lead actress Saoirse Ronan. Best Performance by an actor in a comedy or musical went to James Franco for The Disaster Artist, Best performance by an actress in a supporting role in any motion picture went to Allison Janney for I, Tonya. The Best animated motion picture honor went to Pixar's Coco, while the Best motion picture, foreign language went to In the Fade, the Best original score went to Alexandre Desplat for The Shape of Water, and the Best original song went to "This Is Me" for The Greatest Showman. Christopher Nolan's Dunkirk was expected to bring home some awards as was Steven Spielberg's The Post, but both movies went home empty handed. It really seemed as if all bets were off at the Golden Globes awards ceremony this year, which made for an exciting broadcast that had some very powerful moments. Some of the more powerful moments came during the awards given to TV shows, specifically Big Little Lies. 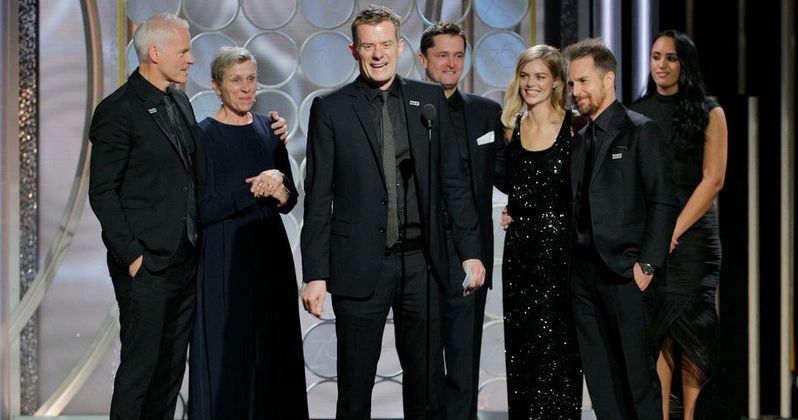 HBO's limited series won four awards, including acting prizes for stars Nicole Kidman, Alexander Skarsgard, and Laura Dern. Dern and Kidman gave passionate speeches about speaking up in times of trouble, which was the theme of the evening. Big Little Lies also won the Best Limited Series award. Amazon's The Marvelous Mrs. Maisel and Hulu's The Handmaid's Tale won two awards apiece, including the top prizes, respectively, in the comedy and drama series categories. The Best performance by an actor in a television drama series went to Sterling K. Brown for This Is Us, Best performance by an actress in a television in a musical or comedy series went to Rachel Brosnahan for The Marvelous Mrs. Maisel, Best performance by an actor in a television musical or comedy series went to Aziz Ansari for Master of None, and Best performance by an actor in a limited series or motion picture made for television went to Ewan McGregor for Fargo. Greeted by loud applause, Oprah Winfrey started her acceptance speech for the Cecil B. DeMille award by recounting Sidney Poitier making history as the first black man to win an Academy Award. Winfrey said, "I had never seen a black man being celebrated like that," as she accepted the lifetime achievement award. Winfrey also took a moment to reflect on her own historic moment, mentioning that there are likely many girls at home watching the first black woman take home the Cecil B. DeMille Award. In addition, Oprah Winfrey spoke out about the importance of the press, which has come under fire under the current administration in office. In a night of many highlights, Oprah Winfrey went out and made an eloquent speech that summed up the entire night and most of the last year. You can read more about the winners of the 75th Golden Globes courtesy of GoldenGlobes.com.